It's a commonly raised question within the Melbourne poetry community: how to bring poetry back into the public mind? Are we content as readers and writers of poetry to remain marginalised while sport maintains its deified position in this country? Moving Galleries, an initiative recently launched on Melbourne's trains, is an attempt to redress this imbalance. Coordinated by the Committee for Melbourne, the project consists of decals posted on the inside of twenty metropolitan trains. Each decal contains either two rooku by different poets (36 in total), or a work of art (18 in all) by a Victorian student. The concept is to create 'mobile galleries' that commuters can visit and experience in transit. Rooku is a term that has been adopted in Melbourne to describe the less traditional form of haiku, which is gaining popularity worldwide. Rooku has an Australian bent, and is more relaxed in structure and content than the original Japanese style. The term works well in a marketing sense – it's catchy – which is useful when seeking corporate support. We chose this form because it is accessible and can be attempted by the novice, yet contains the fundamental elements of poetry – the distillation of language and the layering of meaning. It is a poetic snapshot of a moment in time. 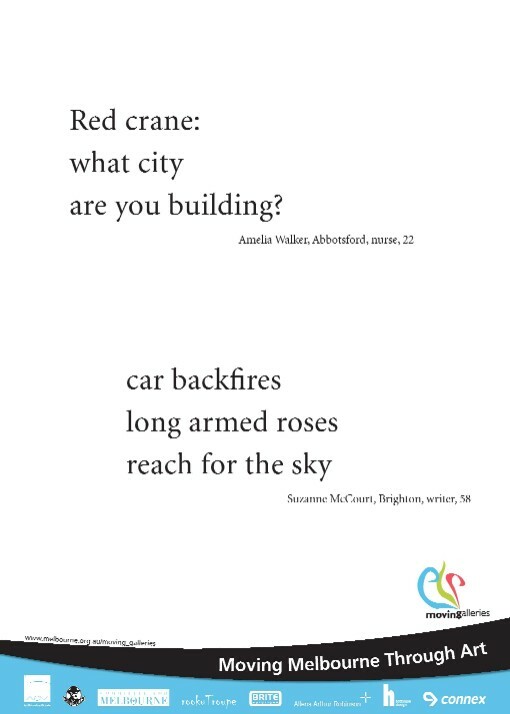 This is, of course, not the first public transport arts project in Australia – there are numerous cases of public poetry projects on trams and trains, and recently there has been The Red Room Company's Toilet Door Poetry – but the following account of how this project came to light is an important reminder of how it is possible for poetry to create its own very public space. The idea first came to me, in part, at a rooku reading in Northcote during the Overload Poetry Festival in 2004. As I looked around me, listening to those three-liners so poignant, so distilled, I had a sense that all of this belonged in the wider world. Soon after I saw the Jane Campion film In the Cut, where a woman's life is increasingly interwoven with lines of poetry on the New York subway (Poetry in Motion started in 1992). This evoked memories of vacant faces on the Tube, years ago in London, but above them, plastered across the walls, there was verse, a point of light. 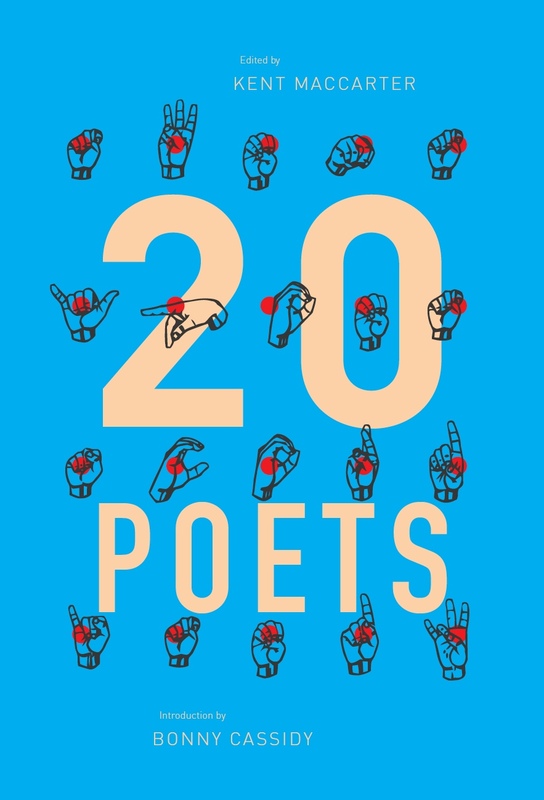 Poems on the Underground is now celebrating its 20th year. It seemed the perfect combination – short form poetry, rather than extracts, that commuters could read and appreciate, even on the shortest trip. And then, if the moment took them, write their own, email it to a predestined site once they got home, or to work. Add to this the fact that you can fit a rooku in an SMS. SMS poetry has its precedents – there's the onesixty site initiated in the UK (which is now archival), as well as the City Poems project which is currently being run in Leeds and Antwerp, whereby the public can ring a number listed at poetry points around the city, and receive regularly updated short poetry by SMS. By incorporating current technologies the common conception of poetry as obsolete is challenged, and it encourages a new generation to find relevance in poetic forms. 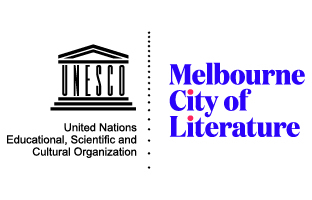 In our case, what was needed was an editorial team, so I enlisted the help of Matt Hetherington and Myron Lysenko – well-known Melbourne haijin, convenors and editors – and at the 2005 Overload rooku reading, we announced our plan to an enthusiastic audience. It was decided I would contact Connex to discuss feasibility, which I did the following week, to discover they were already negotiating a similar idea with the Committee for Melbourne – a large not-for-profit conglomerate of corporate groups dedicated to promoting Melbourne. I contacted the group, and soon after the serendipitous connection was made with Stuart Weir, leader of the Future Focus Group that had already begun discussions with Connex about an art/poetry project on trains. Stuart had also seen the New York and London projects and hoped to do something similar in Melbourne – all they needed was some direction, which on the poetry side we were happy to provide. AEV (Arts Education Victoria) came on board soon after to select the artwork from their Achievement Through Art programme. Within days I was presenting our concept outline to Connex, and the Future Focus group at the Committee for Melbourne. And each time as I finished going over our objectives, and we turned the page to look at examples of rooku, at the poetry, the faces around those conference tables changed. There was the instant of discovery, delight in the words and the spaces between them, and I remember saying to myself: this will work. People like poetry – you just have to show them the way in. What this project does is to provide the public with thirty-six rooku, thirty-six different opportunities to connect with the poetic in their lives. And just as people have many different ways of doing this, we selected work that represents a variety of demographics and aspects of our lives, from the large number of submissions that we received. For some of us it's sports such as football that show us the way in. For others it's the landscape, the beach. There's the wonderment of nature, the astral. For some it's through experience that they connect with the poetic: love; grief; a sense of disengagement; or reconnection with the places we come from. Or it's the details of our domestic life – the ex-girlfriend, the dead cat. For others it is the esoteric, the profound, that draws them into that moment of stillness. And for many, of course, it's humour that brings them closest to an understanding of how words and emotion are inseparable. Even our ubiquitous Lord Mayor is represented. And let's not forget the voice of the child. Thirty-six possibilities of connecting with the poetic are finding an audience – an audience most poets never dream of in terms of numbers and variety. 134 million commuters a year sitting under, across from, leaning into these poets' words; what was once an idea. Beneath each poem, we put details of the poet, in order to create a story about each individual, and to emphasize the democratic nature of the project. Yes, established poets are represented here, but so are first-timers and emerging writers, and the hope is that this will encourage the public at large to participate. The project is as much about bringing people to poetry, as poetry to the people, and seeing work written by somebody from their suburb may be the determining factor in engaging that individual. The first phase of the project is up and running as of April this year. As for the future, that will depend on public support, its effectiveness in reducing graffiti, and a variety of other factors, mostly logistical. Moving Galleries has received considerable support from the local poetry community. No doubt there will be those who view such projects as a watering down of the art, but we're working from the notion of creating readership and engagement at a variety of levels. Care was taken to select a wide range of rooku, from the esoteric to the purely domestic, with the more accessible rooku placed above a more challenging piece, to lead the reader in. Projects such as these educate the public in new forms, and the enormous variety of poetry that exists, and aim to make them relevant to the large majority of people who will never attend a reading, or buy a small press poetry collection. In my mind, the defining image is of a 42-year-old financial advisor, somewhere between Kooyong and Richmond, looking across at one of the rooku decals, sports pages still open on his knee, and connecting with poetry – for the very first time. 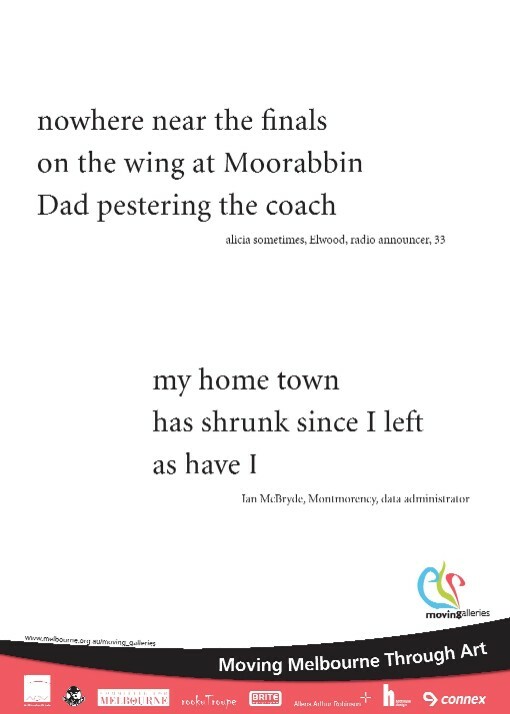 This entry was posted in FEATURES and tagged haiku, melbourne, public transport. Bookmark the permalink.